I had a great dinner at the Novotel with Jaci Thorne, Regional Tourism Manager Barossa Tourism. She picked a bottle of Radford Dale Eden Valley Riesling since it was one of the places I wouldn’t get a chance to visit and it was a good choice, not to dry, with just enough citrus to keep its flavor. 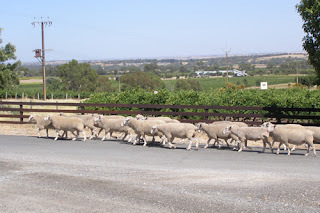 I got some sleep and then it was off to another day of my Australian adventure around Barossa Valley, home to a lot more than just Jacob’s Creek. Chris of A Taste of South Australia picked me up at the hotel for my tour of the Barossa region. He had a couple of plans in mind already and so did I. 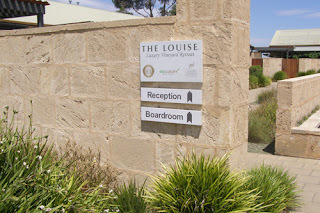 As we made our way around Barossa, Chris pointed out some sites, starting with the memorial plaques on Commemorative Drive, the road my hotel was on. It turns out the plaques were representative of the early settlers in South Australia. We continued on our way with a quick stop at Grant Burge & Kroncort for some coffee, where we ran into the owners of Villa Tinto Winery, a small family winery Albert and Dianne Di Palma own and run, with dedication to Albert’s Argentinean heritage. I was disappointed we wouldn’t have time to stop by, but the schedule was already full. 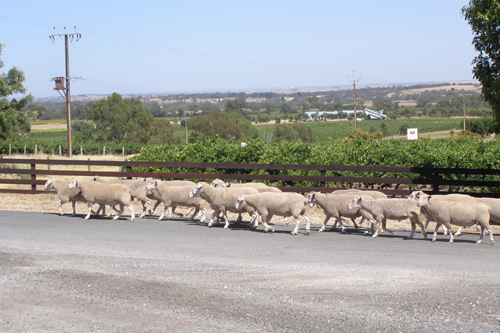 After waiting for the sheep to pass by, we continued first with a visit to another small winery, Rockford. We just spent a short time there, sampling their unusual selection, including Riesling, Semillon, Frontignac, and Alicante Bouchet. As I often do when on these trips, I put out a note on Twitter that I would be in the area and had a little time. 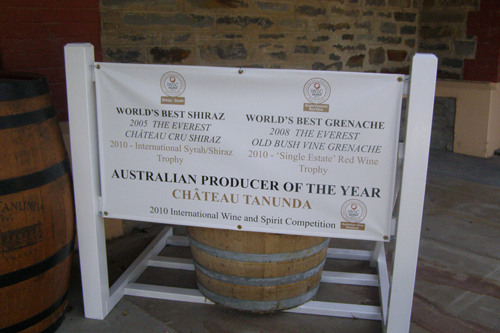 Chateau Tanunda responded that they would love to give me a tour and tasting. After a quick look at their website, I thought it was a great idea. Chateaus may have been common when I was in France, but you’ll have a difficult finding a selection in Australia. This one was built in 1890 and belongs to the Gelber family, who began refurbishing it in 1998. It addition to keeping the tradition of a chateau, it is dedicated to the family passions with a Cricket Oval and a Croquet Lawn. 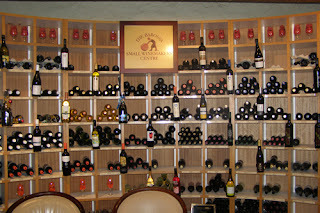 There are no living quarters at Chateau Tununda, but there is certainly wine. 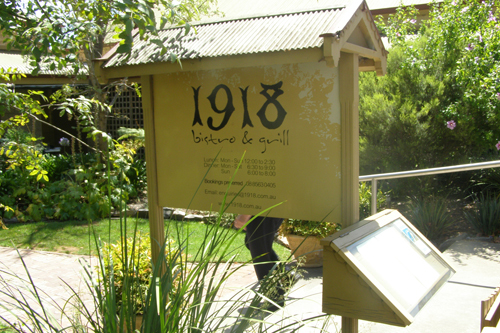 Grapes are grown on 250 acres of vineyards in and around Barossa. Almost everything made here is done by hand with gentle pressing. They do open fermentation to get the softness from the wines rather than harsh tannins. It shows in the wines, which include a superb Chateau Tanunda Old Bush Vine Grenache Rose, slow fermented in an old wooden cold stone for 3 weeks. With just a hint of mineral and subtle fruit, it goes down smooth. Three Graces can vary in its blends, but the 2008 I had was great with Cabernet Franc (29%), Merlot (25%) and Cabernet Sauvignon (46%). Chateau Tanunda has many other wines of note, including the Chateau Tanunda 100 year Vines 2008 Shiraz -- very spicy and not overly dry. 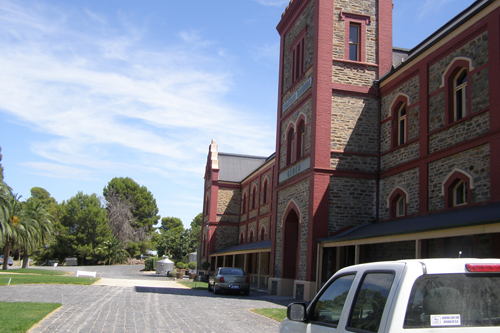 They are one of the wines in Australia that is being distributed to the U.S, but if you visit their winery you can also check out other wineries, as Chateau Tanunda is the home of the Barossa Small Winemakers Centre so you will find bottles from many other wineries here. Chris and I had a delicious lunch at the quaint 1918 Bistro & Grill that included a Spanish Meatball with Polenta and goat cheese. It’s a place filled with locals looking for a relaxing lunch. For a more extravagant meal, check out Appellation, where Chef Mark McNamara offers a locally fresh selection that you can get as a full tasting menu, a few courses or a la carte. He also will alter anything to accommodate food allergies or intolerances – just let him know when you make the reservation. You can also indulge all you want in the vast wine menu at Appellation and stay in luxurious comfort at the attached accommodation, The Louise. This boutique property has only 15 suites (with amenities such as outdoor showers and indoor Jacuzzis) so you can expect personalized service. On the way out of the Barossa, we past some other places that are on my list for the next trip, including Lyndoch Lavender Farms, the tiny village of Williamstown and Amadio Vineyards, but I had been waiting all day for my final stop. My schedule had read “Cuddle a Koala at Gorge Wildlife Park.” I had seen a few Koalas in Australia and even pet one at the Healesville Animal Sanctuary, but none seemed terribly interested in seeing me. Apparently sleeping 21 hours a day was more exciting. 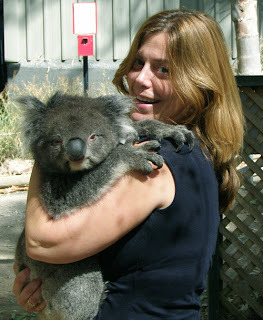 It was different with Claire, and when she was placed in my arms we were both comfy! I actually pet her for awhile while she ate some leaves. It was definitely an “I’m really in Australia” moment and I was sure it wouldn’t be the last.